February 21, 2017 "Information Clearing House" - "Tom Dispatch" - The United States has already lost -- its war for the Middle East, that is. Having taken my own crack at combat soldiering in both Iraq and Afghanistan, that couldn’t be clearer to me. Unfortunately, it’s evidently still not clear in Washington. Bush’s neo-imperial triumphalism failed. Obama’s quiet shift to drones, Special Forces, and clandestine executive actions didn’t turn the tide either. For all President Trump’s bluster, boasting, and threats, rest assured that, at best, he’ll barely move the needle and, at worst… but why even go there? Lead from the front. Lead from behind. Surge yet again… The list goes on -- and on and on. Through the first half of the Cold War, the Middle East remained a sideshow. In 1979, however, all that changed radically. First, rising protests against the brutal police state of the American-backed Shah of Iran led to regime collapse, the return of dissident ayatollah Ruhollah Khomeini, and the declaration of an Islamic Republic. Then Iranian students stormed the U.S. embassy in Tehran, holding 52 hostages for more than 400 days. Of course, by then few Americans remembered the CIA-instigated coup of 1953 that had toppled a democratically elected Iranian prime minister, preserved Western oil interests in that country, and started both lands on this path (though Iranians clearly hadn’t forgotten). The shock and duration of the hostage crisis undoubtedly ensured that Jimmy Carter would be a one-term president and -- to make matters worse -- Soviet troops intervened in Afghanistan to shore up a communist government there. It was quite a year. That was a major turning point for the U.S. military. Before 1979, few of its troops had served in the region. In the ensuing decades, America bombed, invaded, raided, sent its drones to kill in, or attacked Iran, Lebanon, Libya, Saudi Arabia, Kuwait, Iraq, Somalia, Afghanistan, Pakistan, Yemen, Iraq again (and again), Somalia (again and again), Libya again, Iraq once more, and now Syria as well. Before 1979, few -- if any -- American military personnel died in the Greater Middle East. Few have died anywhere else since. Naturally, the threat of Islamic terror was never limited to the Hindu Kush, so Washington "had" to take its fight against terror global. Admittedly, the subsequent conquest of Iraq didn’t exactly turn out as planned and perhaps the Arabs weren’t quite ready for American-style democracy anyway. Still, the U.S. was committed, had shed blood, and had to stay the course, rather than cede momentum to the terrorists. Anything less would have dishonored the venerated dead. Luckily, President George W. Bush found an enlightened new commander, General David Petraeus, who, with his famed “surge,” snatched victory, or at least stability, from the jaws of defeat in Iraq. He had the insurgency all but whipped. Then, just a few years later, “spineless” Barack Obama prematurely pulled American forces out of that country, an act of weakness that led directly to the rise of ISIS and the current nightmare in the region. Only a strong, assertive successor to Obama could right such gross errors. It’s a riveting tale, of course, even if it is misguided in nearly every way imaginable. At each turn, Washington learned the wrong lessons and drew perilous conclusions. At least the first Gulf War -- to George H.W. 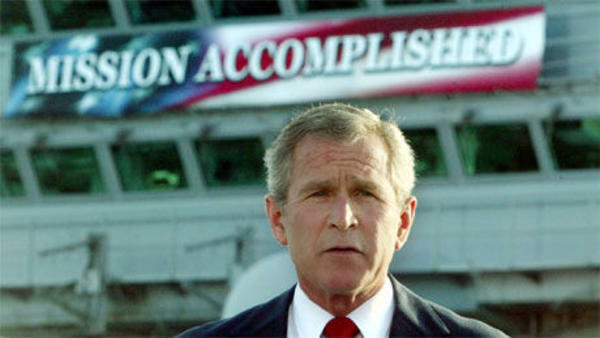 Bush’s credit -- involved a large multinational coalition and checked actual Iraqi aggression. Instead of cheering Bush the Elder’s limited, prudent strategy, however, surging neoconservatives demanded to know why he had stopped short of taking the Iraqi capital, Baghdad. In these years (and for this we can certainly thank Bush, among others), Americans -- Republicans and Democrats alike -- became enamored with military force and came to believe that it could solve just about any problem in that region, if not the world. This would prove a grotesque misunderstanding of what had happened. The Gulf War had been an anomaly. Triumphalist conclusions about it rested on the shakiest of foundations. Only if an enemy fought exactly as the U.S. military preferred it to do, as indeed Saddam’s forces did in 1991 -- conventionally, in open desert, with outdated Soviet equipment -- could the U.S. expect such success. Americans drew another conclusion entirely: that their military was unstoppable. Then things turned ugly fast. This time around, Saddam’s army simply melted away, state institutions broke down, looting was rampant, and the three major communities of Iraq -- Sunni, Shia, and Kurd -- began to battle for power. The invaders never received the jubilant welcome predicted for them by Bush administration officials and supportive neocons. What began as a Sunni-based insurgency to regain power morphed into a nationalist rebellion and then into an Islamist struggle against Westerners. Nearly a century earlier, Britain had formed Iraq from three separate Ottoman imperial provinces -- Baghdad, Basra, and Mosul. The 2003 invasion blew up that synthetic state, held together first by British overlords and then by Saddam’s brutal dictatorship. American policymakers seemed genuinely surprised by all this. As it turned out, no matter the efforts of the globe’s greatest military, no easy foreign solution existed when it came to Iraq. It rarely does. Unfortunately, few in Washington were willing to accept such realities. Think of that as the twenty-first-century American Achilles' heel: unwarranted optimism about the efficacy of U.S. power. Policy in these years might best be summarized as: “we” have to do something, and military force is the best -- perhaps the only -- feasible option. It couldn’t be more obvious that Washington’s officialdom regularly and repeatedly drew erroneous lessons from the recent past and ignored a hard truth staring them in the face: U.S. military action in the Middle East has solved nothing. At all. Only the government cannot seem to accept this. Meanwhile, an American fixation on one unsuitable term -- “isolationism” -- masks a more apt description of American dogma in this period: hyper-interventionism. Consider the last few decades in Iraq and Syria. In the 1990s, Washington employed economic sanctions against Saddam Hussein and his regime. The result: tragedy to the tune of half a million dead children. Then it tried invasion and democracy promotion. The result: tragedy -- including 4,500-plus dead American soldiers, a few trillion dollars down the drain, more than 200,000 dead Iraqis, and millions more displaced in their own country or in flight as refugees. In response, in Syria the U.S. tried only limited intervention. Result: tragedy -- upwards of 300,000 dead and close to seven million more turned into refugees. So will tough talk and escalated military action finally work this time around as the Trump administration faces off against ISIS? Consider what happens even if the U.S achieves a significant rollback of ISIS. Even if, in conjunction with allied Kurdish or Syrian rebel forces, ISIS's “capital,” Raqqa, is taken and the so-called caliphate destroyed, the ideology isn’t going away. Many of its fighters are likely to transition back to an insurgency and there will be no end to international terror in ISIS’s name. In the meantime, none of this will have solved the underlying problems of artificial states now at the edge of collapse or beyond, divided ethno-religious groups, and anti-Western nationalist and religious sentiments. All of it begs the question: What if Americans are incapable of helping (at least in a military sense)?